SAN FRANCISCO (CNS) — Smiling and singing “Amazing Grace” and the “Battle Hymn of the Republic,” hundreds of high school and college students led tens of thousands of pro-life supporters along San Francisco’s Market Street in the 14th Annual Walk for Life West Coast. The event, which begins each year with a rally in the Civic Center, is followed by the walk from City Hall to the wharf behind a street-wide banner that proclaims, “Abortion Hurts Women.” This year the Walk for Life was held Jan. 27, one week after more than 50,000 pink-clad participants in the Women’s March converged on the city’s downtown streets. Eva Muntean, the pro-life event’s co-chair, wore a pink shirt, for the Walk for Life, saying she was “taking back pink,” which supporters of legal abortion have made their signature color. “We are here to take back the narrative that abortion is a right,” Muntean told the crowd from the stage in front of City Hall. For many, the day began with a packed Mass at St. Mary’s Cathedral, where San Francisco Archbishop Salvatore J. Cordileone began his homily by noting that the U.S. Congress has been debating the Born-Alive Abortion Survivors Protection Act. The U.S. House Jan. 19 passed the measure, which prohibits a health care practitioner from allowing the death of a baby born alive during an abortion or an attempted abortion. It requires health care personnel “to exercise the same degree of care as reasonably provided to any other child born alive at the same gestational age, and ensure that such child is immediately admitted to a hospital.” The House passed the bill in a bipartisan vote of 241-183; the U.S. Senate must still vote on it. “Amazingly, but I suppose not surprisingly, there are people who actually oppose giving the same protections to these infants that all other children enjoy who are outside of the womb,” Archbishop Cordileone said. “We don’t want our centers of learning to become centers of killing,” Meehan said. The Walk for Life West Coast was founded on the Feminists for Life of America slogan and principle that “Women Deserve Better Than Abortion,” and one of the speakers in particular brought that point home. “In this sanctuary city also known for bridge-building, we are all stating loudly that we want our neighbors to consider the womb a sanctuary for the unborn members of our human families,” said Dr. John Bruchalski, founder of Tepeyac Family Center in Fairfax, Virginia, an OB-GYN practice named for the hill where Our Lady of Guadalupe appeared to a poor Indian, St. Juan Diego, in 1531. The faith-based practice provides “excellent medicine” to women without regard to financial situation, belief or background. Abortion does not just hurt women, and kill babies, “abortion also hurts the providers who provide that service,” Bruchalski told the rally at the Civic Center in San Francisco. Bruchalski performed many abortions as a resident before realizing its harm. He said abortion darkened and hardened his heart before he was reconverted to his Catholic faith. “As a doctor who knows that abortion hurts women,” he said, “I want all the young people here (to know): We need you. We need you to enter and return medicine back to the prolife movement. That’s a practical way you can make a difference. Other speakers at the walk included Terri Beatley of the Hosea Initiative, which is dedicated to continuing the pro-life work of the deceased “father of the abortion movement” Dr. Bernard Nathanson; after performing 60,000 abortions by his own estimate, Nathanson had a change of heart and became a prominent opponent of abortion. Also addressing the crowd was Joseph Scheidler, founder of Pro-Life Action League, who received the Gianna Molla Award; and the Rev. Clenard Childress, the walk’s traditional closing speaker. Rev. Childress spoke at the first walk and at almost every one since. 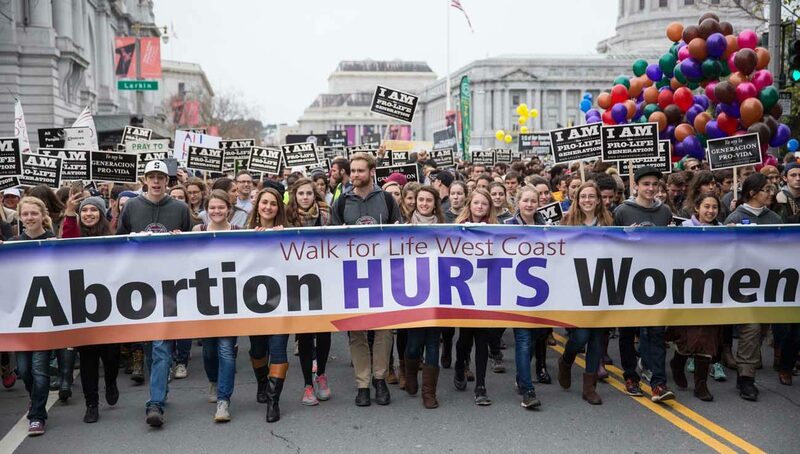 Founded in 2005 by a group of San Francisco Bay Area residents, the Walk for Life West Coast’s mission is to change the perceptions of a society that thinks abortion is an answer.